Gautham Menon has a strong penchant for music and he sung the vintage songs in the title card of Varanam Aayiram. The director also hosted the audio launch of Kumki and sung various songs to introduce the chief guests of the function. Now the latest information is that the maverick director has crooned for a number in Radha Mohan's upcoming film Uppu Karuvadu. 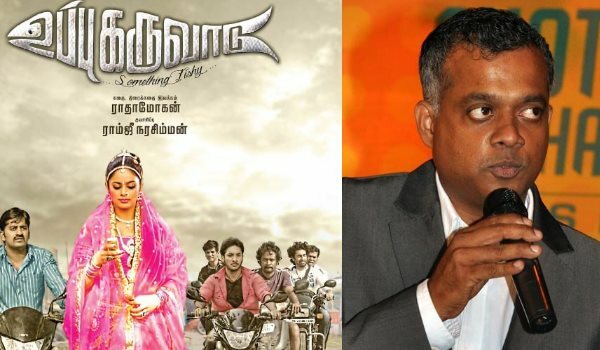 Director Radha Mohan while speaking about this said, "Gautham Menon is my close friend. I have seen him singing in the parties. Music composer Steve Watts is also a close friend of Gautham Menon. So we decided to make Gautham sing. He readily agreed and sang for our film. The song has also come out well." Says Radha Mohan, 'It was my music composer, who suggested me that I should rope in Gautham as singer. Though Gautham could not record the song when he was shooting for Yennai Arindhaal, he took time and came to record recently. The song is penned by Madhan Karky'. Uppu Karuvadu has Sathish, Nandita, Karunakaran in main role. Others in the cast are M S Bhaskar, Mayilsamy, Kumaravel, Chaams, Narayan, new face Rakshita, Saravanan and Doubt Senthil. Satish who was in charge of choreography has also donned an important role in the film. Mahesh Muthusamy is handling the camera. The film has been jointly produced by Ramji Narasimhan’s First Copy Pictures and Radha Mohan’s Night Show Pictures.